Sometimes we speak of far-away places as being “at the ends of the Earth.” That is, they are far away from what we consider to be civilization, are hard to get to, sparsely populated and may contain natural beauty in abundance. One place that would surely fill those requirements would be China’s remote Kunlun Mountains. Stretching from west to east for 3,000 kilometers, they touch the Pamir Mountains of Tajikistan in the west and extend eastward to the edge of the North China Plain. 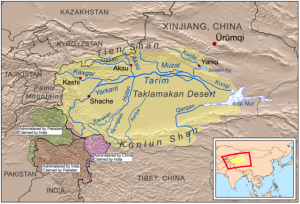 The Kunlun Mountains also act as a border between the Tibet Plain and the Tarim Basin, which includes the Taklimakan Desert and Qinghai. 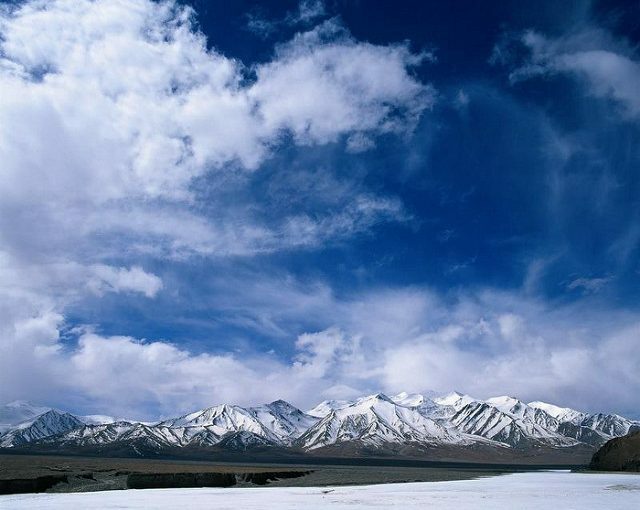 The Kunlun Mountains are a majestically beautiful but unforgiving environment; they are both arid and frigid in turns and are known for their extremely high winds. While there is more vegetation at lower altitudes, they are basically rock desert with not much growing there. Despite the harsh conditions there is both wildlife and human inhabitants. The mountains are host to the Tibetan Gazelle, Tibetan Goat, wild yaks, Ibex, wolves, and even some brown bear. There are Mongol herders in the Qiadam Basin area who keep horses, sheep, and yak and Tibetan nomads in the Qinghai Lake region. Wildlife was under threat from over-hunting and poaching, but efforts are being made to preserve the ecosystem. Perhaps because of their inaccessibility, the Kunlun Mountains have played a large part in people’s imagination and mythology. They were first thought to be a Taoist paradise, and King Mu ( 976–­922 BCE) was said to have visited the area and found the Jade Palace of the Yellow Emperor. Legend has it that even the Queen of Sheba eventually ended up among the Kunlun peaks. In modern times the 1933 novel by James Hilton, Lost Horizonhad its mythical city of Shangri-La located in the Kunlun Mountains. There is also a fictional martial arts school called Kunlun Sect that appears in Heaven Sword Dragon Sabreby Jin Yong, and a real martial arts school that still exists called Kunlun Fist. Physics, philosophy, and common sense tell us that nothing lasts forever, and change is the only constant. This may be true, yet China’s Kunlun Mountains seem to exist in a time frame beyond our everyday understanding and comprehension. 前 前の投稿: Davos 2019 – More Important Than Ever. 次ページへ 次の投稿: Wishing You A Happy New Year 2019!